From Wikipedia: This is a small kingfisher, 13 centimetres in length. The general color of the upper parts of the adult bird is bright metallic blue. The head has a short crest of black and blue feathers, which gives rise to the scientific name. The face, cheeks and underparts are rufous and there are white patches on the throat and rear neck sides. The bill is black in young birds and reddish orange in adults; the legs are bright red. Sexes are similar, but juveniles are a duller version of the adult. This is a species common to reeds and aquatic vegetation near slow moving water or ponds. 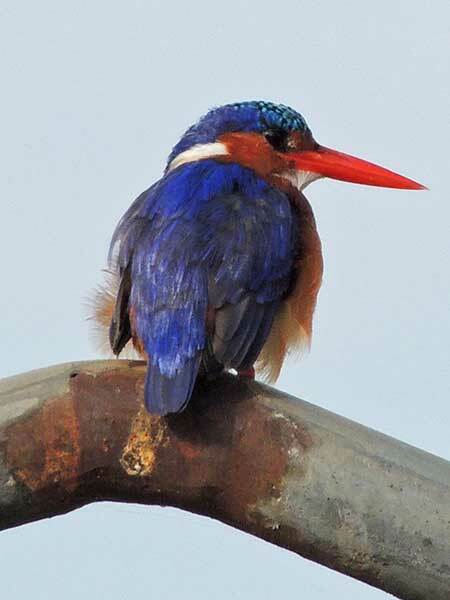 The flight of the malachite kingfisher is rapid, the short rounded wings whirring until they appear a mere blur. It usually flies low over water.